I’ve made more bentos recently but they all looked boring. But at least I got a lot of use out of this thermal bento box recently. Yay for soups when it’s cold and iffy outside! 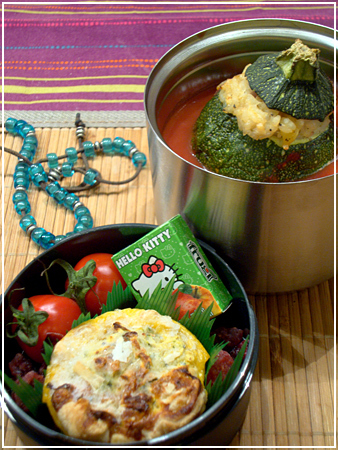 This one has a ball zucchini stuffed with zucchini risotto in tomato sauce. The top layer is a frozen mini quiche, some cherry tomatoes and various dried fruit. Ooh! The zucchini looks yum! I need to buy a thermal bento too since I LOVE soups! amazing the work with the zuchini!